If you are one of these Students, fear not! Improving your typing skills is something you can easily do at home. You can even do it alongside your studies for ILSPA so that when you achieve our qualification, you are all set to go and will have the required skills for securing employment. There are training companies who provide typing courses, such as Pitman Training; but if you prefer the ease of learning at home, we highly recommend typing.com. Through Typing.com, you can sign up for free and learn touch typing from the comfort of your own surroundings. You simply work through the online lessons and aim towards your desired speed and level of accuracy. After you have done sufficient practise, you can complete online tests which enable you to see how far you have progressed. You can even print off a certificate to show what level you are at. The great thing about Typing.com is that you can sign up for free! You can also work through the beginner level and progress on to the intermediate and advanced levels. You will be a highly skilled typist in no time at all and be able to impress recruiters with your proficiency. Touch typing is an essential skill to have in our advancing digital world. Typing is also a big part of the Legal Secretary role. ILSPA recommends that you should type a minimum of 60 words per minute. 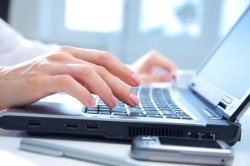 Depending on the position you hold, some firms may want you to type faster at, 65 - 80 wpm. This is definitely achievable with commitment and determination. Just set aside 30 minutes or so a day for practise and you will get there. Sign up to Typing.com today and do the best you can for your career. Good luck!